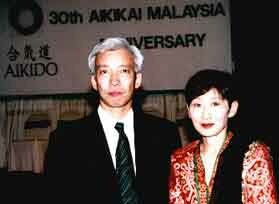 Academy Aikido Jyuku celebrated its 30thAnniversary in commemoration of Yamada Jun Shihan's three decades of Aikido life in Malaysia. 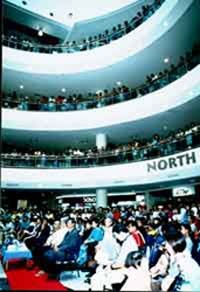 The 30th Anniversary Celebration was held with seminars and demonstrations in Kuala Lumpur, Kuching and Penang from 21st to 25th of September 2001. 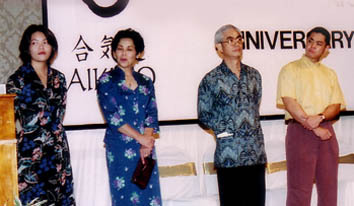 Ueshiba Moriteru Doshu and his wife, Mrs. Ueshiba Kyoko attended the celebration as the guests of honor. They were accompanied byMr. T. Kanazawa, Mr. H. Fujimaki and Mr. H. Sakurai from Hombu Dojo, Tokyo. 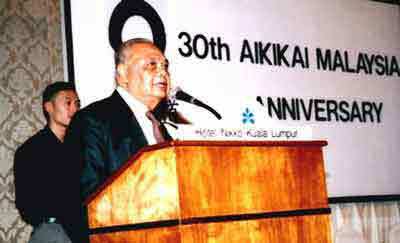 The 30th Anniversary began with Doshu's seminar at HIKMAH Multipurpose Hall in Kuching, then at the International University Malaysia and Police Training Centre(PULAPOL) in Kuala Lumpur. A demonstration was held in Complex Belia dan Sukan Negeri Penang. 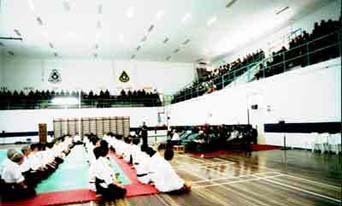 Participants from Singapore, Indonesia, Thailand, United Kingdom, Japan and members of affiliated dojos of Academy Aikido Jyuku amounted to 200 people took part in the seminars. Participants from Japan included NHK Aikido Club from Japan Broadcasting Corporation (NHK), various local branches in Japan and good old friends from the Yamada Shihan's early days at Hombu Dojo. 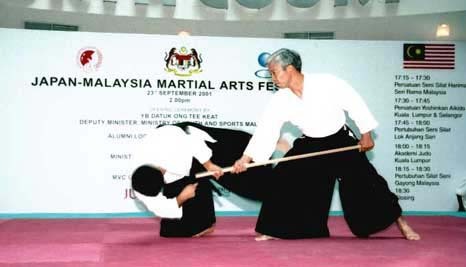 The Japan-Malaysia Martial Arts Festival held at the Mid-Valley Mega Mall started off with the special introduction demonstration by Ueshiba Doshu and later followed by members from affiliated dojos of Academy Aikido Jyuku. The demonstration left the spectators with a favourable impression. 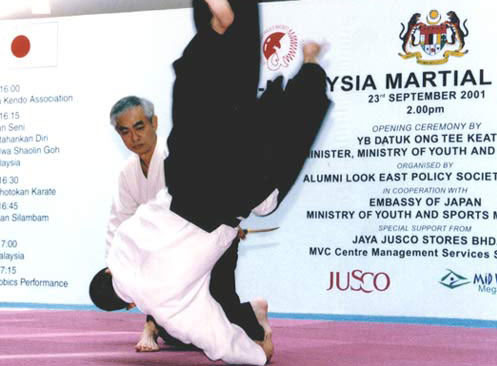 Dato Zulkifli Abdul Malek, President of Alumni Look East Policy Society (ALEPS) marvelled at Aikido movements that inspired him of a controlled yet fluent stream. Others present at the Mega Mall Demonstration were Dato Ong Kee Keat, Minister of Youth and Sports, Ambassador Mr. Kawakami Koichi Charge de Affairs a.i. of Japan Embassy, Mr. Sugihara Masamichi of The Japan Foundation, Kuala Lumpur and Madam Ito Takako of Japan Information Service and our Honourable Chairman Y.A.B Tun Dr Abdul Ghafar Baba. It is an honour for Yamada J. Shihan to be in Malaysia under the recognition and support from the Japanese Embassy, The Japan Foundation and Aikido World Headquarters(Hombu Dojo). 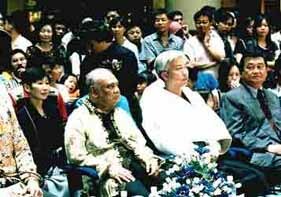 Yamada Shihan is determined to carry out his responsibilities and having the demonstration inviting Moriteru Doshu with three Shidoin of Hombu for the Japan-Malaysia Martial Arts Festival on 23rd September 2001. The Japan-Malaysia Martial Arts Festival held at the Mid Valley Mega Mall started off with the special introduction demonstration by Ueshiba Doshu and later followed by members from affiliated dojos of Academy Aikido Jyuku. 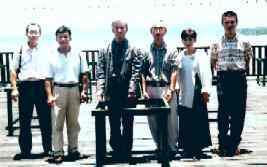 Aikido in Malaysia began in 1971, when several colleagues of Yamada Shihan together with Hombu Officials gathered at HANEDA Airport to wish him well and success in Malaysia. Since then three decades have passed and during the 30th Anniversary Celebration, such old faces are joined together again by fate also with members within Academy Aikido Jyuku and also friends who have scattered to various countries over the years. 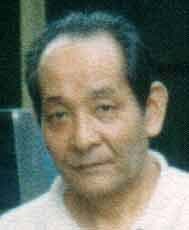 Yamada Jun Shihan has been supervising Academy Aikido Jyuku since 1971 with blessings from the late Ueshiba Kisshomaru 2nd Doshu whose wishes are now carried on by Moriteru Doshu. Yamada J. Shihan and Madam Kimiko are the fortunate ones, having had the experience of learning under O-Sensei, the founder, Kisshomaru Sensei, the 2nd Doshu while training at Hombu Dojo in Wakamatu-cho, Shinjuku. I would like to express my heartfelt congratulations to the Academy Aikido Jyuku on your Thirtieth Anniversary. I am especially pleased that this occasion is being celebrated during the Japan Festival. The Thirtieth Anniversary is a great milestone for the Academy Aikido Jyuku. The late Ueshiba Kisshomaru Doshu considered these celebrations very meaningful. I believe that all has not been smooth sailing for you during these thirty years and that you have undoubtedly faced many difficulties. I would like to pay my deep respect to Yamada Shihan and the members who have supported him for your great efforts in overcoming these obstacles on the way to celebrating your Thirtieth Anniversary today. Please continue to step strongly forward from this important milestone towards even greater accomplishments yet to come. Congratulatory Address of Mr. Hiroshi Somemiya. It is my great pleasure to offer congratulations to you on your Thirtieth Anniversary. Thirty years is a long time, although it may seem quite short once time has flown by. 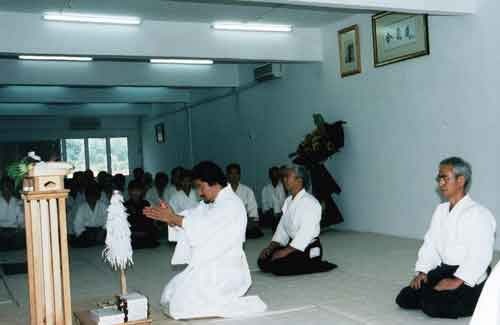 It is hard to believe that thirty years has passed since that morning in Tokyo when I saw Yamada Shihan leave for Malaysia, entrusted by the late Ueshiba Kisshomaru Doshu with the mission to establish and spread Aikido there. 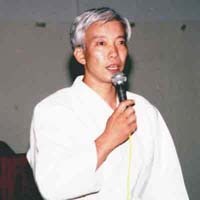 At the time Aikido was not popular in Malaysia, and I feel a deep respect for the great efforts and achievements made by Yamada Shihan and the members of Academy Aikido Jyuku during these short, and yet long, thirty years. O-Sensei used to say that Aikido is the way for everyone to develop themselves and that this daily training never ends. There is an ideal we may strive for, but because of the nature of Aikido, there is not an attainable goal. Aikido is a Budo, and although this is often translated as martial arts, I feel there is a much deeper meaning that O-Sensei intended. Of course, art or technique is important in Aikido, and our ideal can be achieved only through daily training in these techniques. 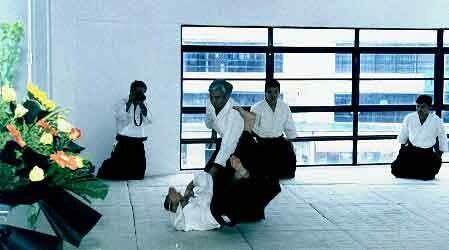 But we must keep in mind that the techniques comprise only the surface of what Aikido is, that there is much more depth to Aikido, and that it is this unseen aspect which is most important. To seek this elusive ideal is very difficult. A Thirtieth Anniversary is undoubtedly a big milestone for Academy Aikido Jyuku. But please be aware that it is only one guidepost by the wayside. The endless path toward the ideal still stretches before you. I do hope that you will renew your commitment to step forward from this point onward towards the many more brilliant milestones that await you. All efforts were done in good faith and we believe our vision in the coming future will be built on a firm trustworthiness among all Malaysian Aikido practitioners. Yamada Shihan and his family would like to express their respect and appreciation to Ueshiba Moriteru Doshu and Madam Kyoko who nevertheless squeezed us into their busy schedule as well as those who have helped in various ways to make the Academy Aikido Jyuku's Thirtieth Anniversary possible. In conjunction with the 30th Academy Aikido Jyuku Anniversary we have moved from Kuching to Kuala Lumpur, supervised under Yamada Jun Shihan. Known as Academy Aikido Jyuku HQ Dojo that is located at Desa Sri Hartamas has been established by Yamada J. Shihan, this dojo serves as the core of Aikido in Malaysia. The opening ceremony was conducted by priest Mr. Hironobu Kondo in the Shinto rite. 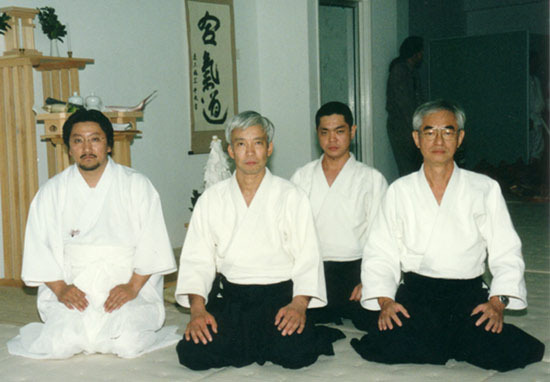 The rite then proceeded with Hounou-Embu (dedicated demonstration) by Ueshiba Doshu and Yamada Shihan. 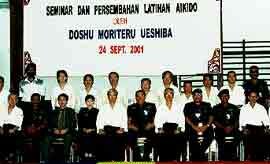 Ueshiba Doshu conducted his demonstration with three Shidoin from Aikido World Headquarters (Hombu Dojo, Tokyo) as Uke. 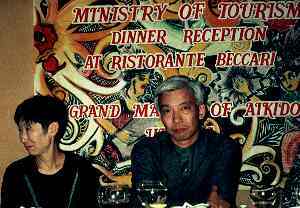 They were Mr. Kanazawa, Mr. Fujimaki and Mr. Sakurai. 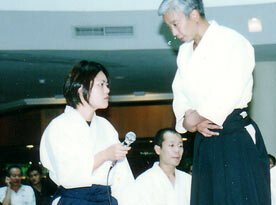 Yamada Shihan conducted his with son, Atsushi. Invited guests were among those who participated in the Thirtieth Anniversary that includes participants from overseas and members of Academy Aikido Jyuku affiliated dojos. Everyone present during this precious moments sat in seiza throughout to experience the divine and auspicious ceremony. The ceremony ended with the giving of Sekihan, the traditional Japanese steamed red-rice with red beans, to each guest as a memento of gratitude of sharing happiness and blessings from the new dojo.